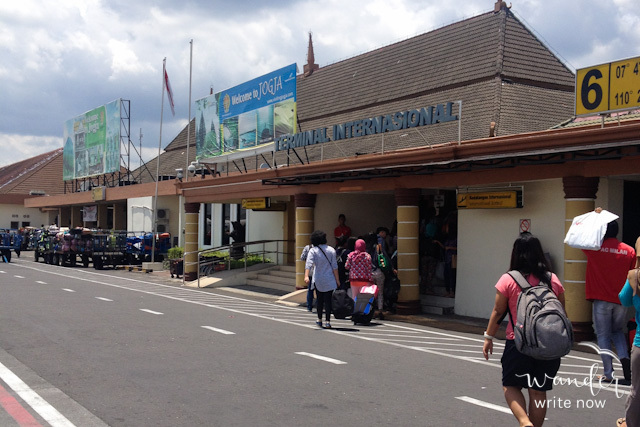 When I boarded my plane to Yogyakarta, I’d expected to spend the entire two-hour flight asleep. I’d never thought that I’d end up talking to a stranger for majority of that time and learn so much about his life story in the process, all because he’d offered to translate the custom declaration form for me! That encounter set the tone for the entirety of my trip—it was filled with apprehensions and lucky interventions, peppered with new experiences and discoveries, and blessed with happy encounters. Thanks to my friendly seatmate, I arrived in Yogyakarta knowing a lot more about Indonesia than I previously had, such as how they had more than 300 languages and even more dialects, how gudeg was the must-try dish in town (it involves chicken, tofu, jackfruit, and rice), and how I looked like a local from one of the cities up north. That last bit threw me off, but I discovered how true that was when everyone kept talking to me in Javanese and giving me surprised looks when I couldn’t understand them. After sailing past immigration, I waved goodbye to my Good Samaritan and found my way to the TransJogja bus stop. It was a good thing I’d researched it beforehand, so I knew what to look for, which was an elevated shelter. With help from the attendants, I got on the right bus that would take me to my home in Yogyakarta—EDU Hostel. The trip lasted more than an hour and took me past several universities. The bus wasn’t air-conditioned, the weather was humid, and everywhere I looked, I remembered home. If not for the foreign language and the mosques, I could’ve been in a Philippine province. I guess it just goes to prove that we truly are neighbors. The bus route took me through Malioboro, otherwise known as Yogyakarta’s shopping street. It wasn’t the row of shops and stalls that caught my attention though. It was the mass of motorbikes spilling over the sidewalks to the street. If there was ever proof that Malioboro was the place to be, especially on a Sunday, that was it. The bus attendant gave me a heads-up before we reached Ngabean Station, which was the closest stop to my hostel. There, a man pointed me in the right direction, and I lugged my backpack some ten minutes to the tall building that was EDU Hostel. To my delight, it was exactly how it looked on its website—clean, colorful, and contemporary. Check-in went without a hitch, and I received my keycard along with a blanket and towel. I’d booked a bed in an all-female dorm room for six, which was located on the second floor. I discovered that there was only one girl in the room other than me. Later that night, two Austrians would take up the bunk beds beside mine, but that afternoon, my introduction to hostel living was eased by Czech Teresa, who gave me tips on nearby places to eat and where to refill my water bottle. After depositing my things in my locker, I headed to the padang restaurant next door for a late, late lunch. It rained just as I was finishing up, but that didn’t keep me from exploring the area. Check out the photos below for some street scenes I chanced upon while walking! Rooftop pool and lounge areas FTW! It’s the Google Street View car!